This red octopus is one of about 3,300 species of cepahlopods alive today. Octopuses (Octopus spp.) are a family of cephalopods (a subgroup of marine invertebrates) known for their intelligence, their uncanny ability to blend into their surroundings, their unique style of locomotion, and their ability to squirt ink. They are some of the most fascinating creatures in the sea. The octopus (whose correct plural is octopuses, but you may see octopi or octopodes) is essentially a mollusk that lacks a shell but has eight arms and three hearts. The names may seem interchangeable to non-experts, but where cephalopods are concerned, marine biologists are careful to distinguish between "arms" and "tentacles." If the invertebrate structure has suckers along its entire length, it's called an arm; if it only has suckers at the tip, it's called a tentacle. By this standard, most octopuses have eight arms and no tentacles, while two other cephalopods, cuttlefish and squids, have eight arms and two tentacles. All vertebrate animals have one heart, but the octopus is equipped with three: one that pumps blood through the cephalopod's body (including the arms), and two that pump blood through the gills, the organs that enable the octopus to breathe underwater by harvesting oxygen. And there's another key difference, too: the primary component of octopus blood is hemocyanin, which incorporates atoms of copper, rather than hemoglobin, which incorporates atoms of iron. This is why octopus blood is blue rather than red. Octopuses are the only marine animals, apart from whales and pinnipeds, of course, that demonstrate primitive problem-solving and pattern recognition skills. But whatever kind of intelligence these cephalopods possess, it's different from the human variety, probably closer to a cat. Two-thirds of an octopus's neurons are located along the length of its arms, rather than its brain, and there's no convincing evidence that these invertebrates are capable of communicating with others of their kind. Still, there's a reason so much science fiction (such as the book and movie "Arrival") feature aliens vaguely modeled on octopuses. Octopus skin is covered by three types of specialized skin cells that can quickly change their color, reflectivity, and opacity, allowing this invertebrate to easily blend in with its surroundings. "Chromatophores" are responsible for the colors red, orange, yellow, brown, and black; "leucophores" mimic white; and "iridophores" are reflective, and thus ideally suited to camouflage. Thanks to this arsenal of cells, some octopuses can make themselves indistinguishable from seaweed. A bit like an undersea sports car, the octopus has three gears. If it's in no particular hurry, this cephalopod will walk lazily with its arms along the ocean bottom. If it's feeling a bit more urgent, it will actively swim by flexing its arms and body. And if it's in a real hurry (say, because it has just been spotted by a hungry shark), it will expel a jet of water from its body cavity and zoom away as fast as it possibly can, often squirting a disorienting blob of ink at the same time. When threatened by predators, most octopuses release a thick cloud of black ink, composed primarily of melanin (the same pigment that gives human beings their skin and hair color). This cloud is not simply a visual "smoke screen" that allows the octopus to escape unnoticed; it also interferes with predators' sense of smell. Sharks, which can sniff small droplets of blood from hundreds of yards away, are especially vulnerable to this type of olfactory attack. 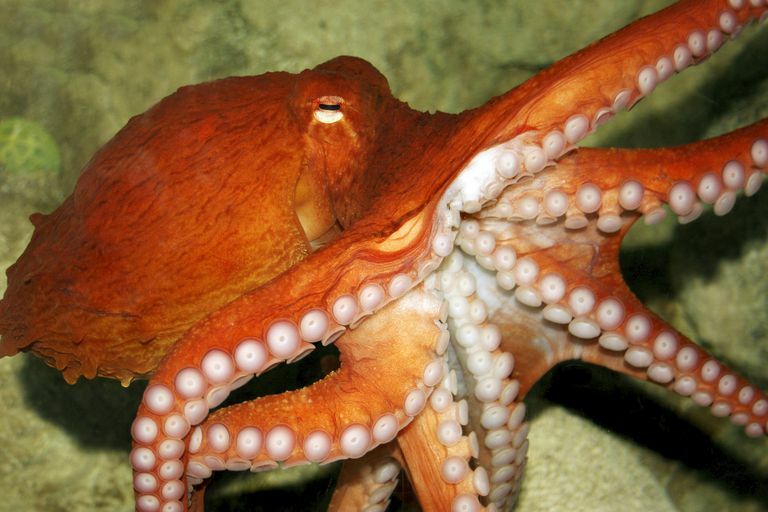 Octopuses are carnivores, and the adults feed on small fishes, crabs, clams, snails, and other octopuses. They typically forage alone and at night, pouncing on their prey and wrapping it in the webbing between their arms. Some octopuses use venom of varying levels of toxicity, which they inject into its prey with a beak similar to a bird's; they can also use their beaks to penetrate and crack hard shells. Octopuses are night hunters, and they spend some of their daylight time in dens, generally holes in shell beds or another substrate, vertical shafts sometimes with multiple openings. If the sea floor is stable enough to permit it, they can be as deep as 15 inches or so. Octopus dens are engineered by a single octopus, but they can be reused by later generations and some species are co-occupied by male and female for a few hours. In laboratory situations, octopuses build dens out of shells (Nautilus, Strombus, barnacles), or artificial terracotta flower pots, glass bottles, PVC tubes, custom blown glass; basically, whatever is available. Some species have den colonies, clusters of dens in a particular substrate. The gloomy octopus (O. tetricus) lives in communal groups of about 15 animals, in situations where there is ample food, many predators and few opportunities for den sites. Gloomy octopus den groups are excavated into shell middens, a pile of shells built by the octopuses from prey. Octopuses have very short lives, between one to three years, and they are dedicated to raising the next generation. Mating occurs when the male approaches the female: One of his arms, typically the third right arm, has a special tip called hectocotylus which he uses to transfer sperm to the female's oviduct. He can fertilize multiple females and females can be fertilized by more than one male. The male dies shortly after mating; the female looks for a suitable den site and spawns a few weeks later, laying the eggs in festoons, chains which are attached to rock or coral or to the walls of the den. Depending on the species, there can be hundreds of thousands of eggs, and before they hatch, the female guards and cares for them, aerating and cleaning them until they hatch. Within a few days, after they hatch, the mother octopus dies. Some benthic and littoral species produce a smaller number of larger eggs which house a more highly developed larva. The tiny eggs produced in the hundreds of thousands begin life as plankton, basically, living in a plankton cloud. If they are not eaten by a passing whale, the octopus larva feeds on copepods, larval crabs, and larval seastars, until they are developed enough to sink down to the bottom of the ocean. There are nearly 300 different species of octopus identified to date—more are being identified every year. The largest identified octopus is the giant Pacific octopus (Enteroctopus dofleini), the full-grown adults of which weigh about 110 pounds or so and have long, trailing, 14-foot-long arms and a total body length of about 16 feet. However, there is some tantalizing evidence of larger-than-usual Giant Pacific octopuses, including one specimen that may have weighed as much as 600 pounds. The smallest (so far) is the star-sucker pygmy octopus (Octopus wolfi), which is smaller than an inch and weighs less than a gram. Most species average the size of the common octopus (O. vulgaris) which grows to between one to three feet and weighs 6.5 to 22 pounds. Anderson, Roland C., Jennifer A. Maher, and James B. Wood. "Octopus: The Ocean's Intelligent Invertebrate." Portland, Oregon: Timber Press, 2010. Bradford, Alina. "Octopus Facts." Live Science / Animals, June 8, 2017. Caldwell, Roy L., et al. "Behavior and Body Patterns of the Larger Pacific Striped Octopus." PLOS One 10.8 (2015): e0134152. Print. Courage, Katherine Harmon. "Octopus! The Most Mysterious Creature in the Sea." New York: Penguin Group, 2013. Leite, T. S., et al. "Geographic Variability of Octopus Insularis Diet: From Oceanic Island to Continental Populations." Aquatic Biology 25 (2016): 17-27. Print. Lenz, Tiago M., et al. "First Description of the Eggs and Paralarvae of the Tropical Octopus, Octopus Insularis, under Culture Conditions." BioOne 33.1 (2015): 101-09. Print. "Octopuses, Order Octopoda." The National Wildlife Federation. "Octopus Fact Sheet." 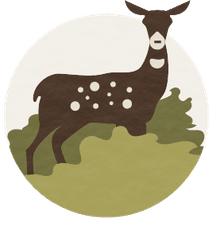 World Animal Foundation.